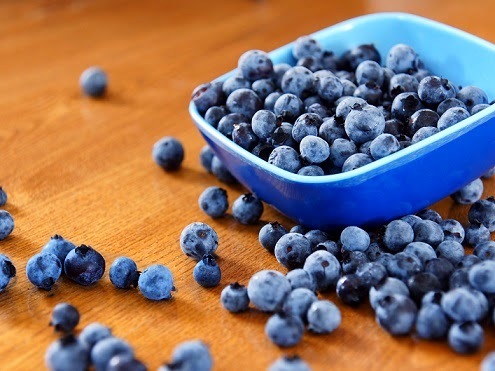 Despite the popularity of blueberries they can still be relatively expensive, the reason for which (in England at least) is that there is no significant blueberry production in the United Kingdom. 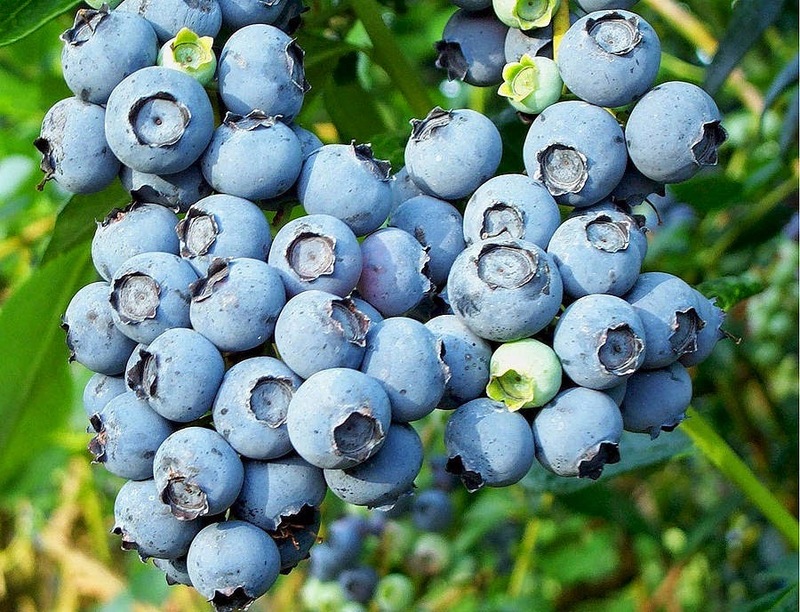 Of course there is nothing stopping you from purchasing your own blueberry bushes but again due to the propagation process these too can be expensive - especially if you are planning to plant out a significant number. 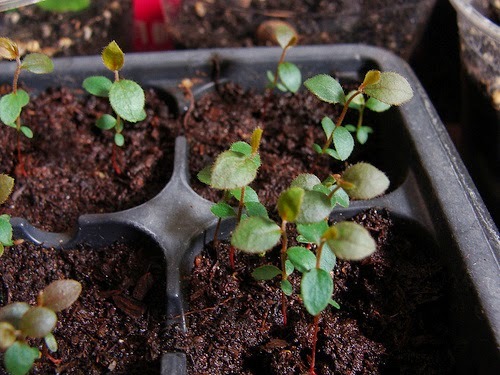 If you have the relative skills and equipment then perhaps the best method of propagating blueberries is by taking cuttings but if you want a bit of fun or possibly create your own unique cultivars then consider growing blueberry plants from seed. Blueberry seeds are are usually sown in October and overwintered outside in a cold frame but with the all-year-availability of blueberry fruit they can be sown at anytime of year so long as you have a heated propagator and a frost-free environment. The seeds of the blueberry are very small so take care in removing them from the fruit. Blueberries grow in damp, acidic conditions so these will need to be replicated. Using a deep, modular seed tray, fill with an ericaceous seed compost or consider making your own using a mix of two parts moss peat and one part horticultural grade lime-free sand. Water the compost in then once the excess has drained away gently press one seed into the surface of the compost of each module. Do not sink the seed into the compost as blueberry seeds need the presence of light to help initiate germination. If you wish you can sprinkle a light covering of vermiculite onto the surface. Place the tray either in a cold frame over the winter and allow to germinate naturally or break the natural dormancy of blueberry seeds by placing them seeds in the bottom of a fridge for 6-8 weeks. After this cold period place the tray inside a heated propagator at a temperature of 16-20 degrees Celsius. Do not allow the temperature to drop below 16 degrees Celsius as this can cause the seedlings to die off. Position the propagator in a bright position but one that doesn't not receive direct sunlight as this can cause the compost to dry out and inhibit germination. Keep the compost moist and germination should occur in 4-5 weeks. Once the seedlings emerge, remove the tray from the propagator and provide cooler temperatures of between 12-16 degrees Celsius. When the seedlings have established in their modules, carefully pop them out, disturbing the root system as little as possible, and pot them on into 3 inch pots using a good quality cutting compost. If the weather is mild then they can be grown outside in a cool, shaded cold frame. If freezing temperatures exists then provide a cool, bright, frost-free position until the threat of late frosts have passed. Then they will need to be hardened off for a couple of weeks before being planted outside. Seedlings grown under cold frames can be planted out once they are about 6-8 inches tall, but only if there is no imminent risk of frost. Blueberries will perform best in a moisture retentive, peaty or lime-free soil in the sun or partial shade. Once the seedlings are large enough to be planted outside there will be no further need to worry about cold damage as they will be perfectly tough once they have been hardened off from propagation conditions. Note. If the seeds do not germinate in the heated propagator then they will need to be returned to cold conditions for a further 6-8 weeks.